← Home Plate: Worth a second visit? The quest to find the youngest, most recent lava flows on Mars inevitably leads back to two highly volcanic regions: Elysium and especially Tharsis. A group of researchers led by Ernst Hauber (DLR, Berlin) has zeroed in on Tharsis. Ignoring the large volcanos, they investigated 83 low shield volcanos on the lava plains between the more lofty structures. 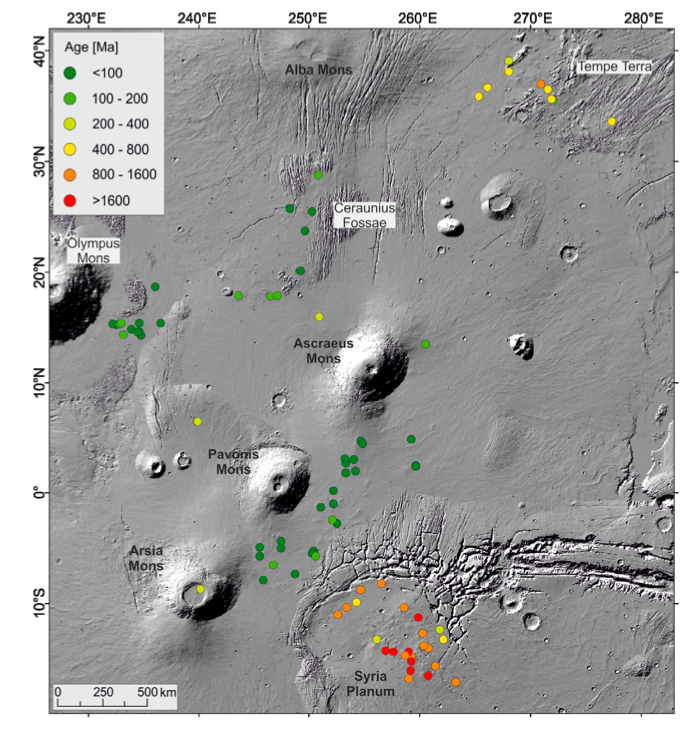 This image (figure 3 in the paper) shows the study area in Tharsis with the ages of shield volcanos coded by color; redder is older, greener is younger. This entry was posted in Reports and tagged CTX, lava flows, Mars Reconnaissance Orbiter, Tharsis, volcanos. Bookmark the permalink.